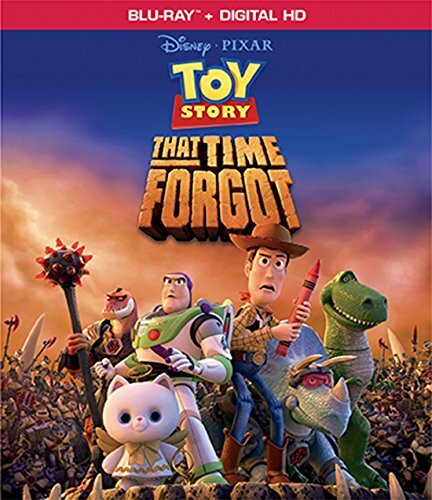 Walt Disney PicturesBuena Vista Home Entertainment has officially announced that it will release on Blu-ray Toy Story That Time Forgot. The release will be available for purchase on November 3. Synopsis: Disney•Pixar proudly presents a hilarious new animated "Toy Story" adventure. During one of Bonnie's post-Christmas play dates, the "Toy Story" crew find themselves in uncharted territory when the coolest set of action figures ever turn out to be dangerously delusional. It's all up to Trixie, the triceratops, if the gang hopes to ever return to Bonnie's room. "Toy Story That Time Forgot" is an unforgettable tale packed with family fun and a must-have for every Pixar fan's collection! Voice Talent: Tom Hanksas Woody ("Saving Mr. Banks," "Captain Phillips"), Tim Allen as Buzz Lightyear ("Toy Story," "The Santa Clause"), Kristen Schaal as Trixie ("Toy Story 3," "The Muppets"), Kevin McKidd as Reptillus Maximus ("Brave," TV's "Grey's Anatomy"), Wallace Shawn as Rex ("The Princess Bride," "Air Buddies"), Timothy Dalton as Mr. Pricklepants ("Toy Story 3," TV's "Penny Dreadful"), Don Rickles as Mr. Potato Head ("Toy Story"), Joan Cusack as Jessie ("Toy Story," "The End of the Tour"). Reptillus! - In this behind-the-scenes look at "Toy Story That Time Forgot," the filmmakers share a peek at the origins of the Battlesaurs world and culture, and explain the character design and development of its greatest hero, Reptillus Maximus. Commentary - Commentary with "Toy Story that Time Forgot" director, Steve Purcell, and head of story, Derek Thompson, on the process of making "Toy Story That Time Forgot." Toy Story Goes to Comic-Con - The "Toy Story that Time Forgot" team heads to San Diego to unveil the project to the public, led by their own longtime Comic-Con veterans, director Steve Purcell and head of story Derek Thompson. My Unexpected Friend - Feel the power - and sing along - as Reptillus Maximus expresses the depth of his feelings for Trixie in this 80's-inspired karaoke video for his soulful ballad, "My Unexpected Friend." Battlesaurs Animated Opening - A 2D animated opening for the fictional animated TV series, "Battlesaurs." ESt-ce que quelqu'un aurait ce court métrage en français par hasard ? Je le cherche mais je ne le trouve pas. En DVD sur Amazon pour 6,99 euros. Merci pour vos réponses mais je voulais juste le visionner une fois, pas forcément l'acheter - surtout acheter un blu-ray juste pour ça ... surtout que je n'ai pas de lecteur sur mon ordinateur donc je ne peux lire ni DVD ni blu-ray.